Historic pictures of the Paris uprising of 1848, the first photographic images to be used in a news story, sold for $265,000 when Sotheby's auctioned them. Illustrations based upon the Daguerreotypes of M. Thibault were published in the French magazine L'illustration n. 279 -280, 1 to 8 July 1848. 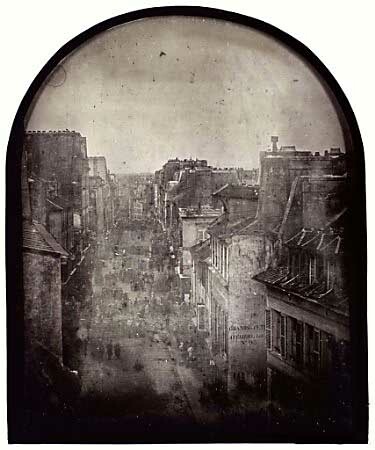 The two daguerreotypes -- images on metal plates -- were taken by a pioneering French photographer named Thibault during the tumultuous June revolt in which more than 3,000 Parisians were killed. The plates were turned into engravings which appeared in the French newspaper L'Illustration Journal Universel alongside a story about the uprising. Thibault's first photograph of the rue St. Maur on June 25 shows a deserted cobbled street piled high with debris to form barricades. The second image, taken the following day, is of the same street, this time filled with inhabitants and soldiers with cannons. This Daguerreotype was bought with the aid of the Photographic Heritage Fund in 2002 and is now part of the collections at the Musée d'Orsay in Paris ® RMN (Musée d'Orsay) / Hervé Lewandowski.